Scenes of devastation in Haiti. We ask your blessings while kissing your right hand. We salute you in the Name of Our Lord God and Savior Jesus Christ. Three weeks after the violent earthquake that devastated Haiti and, according to the latest bulletin from the Haitian Government, caused 212,000 deaths and injured more than 194,000, 4,000 people have become amputees of one or more limbs and a million have become homeless. We of the Orthodox Mission in Haiti are expressing our gratitude for your active solidarity to the victims of the earthquake on Jan 12, 2010. We are sending our thanks to the Holy Synod of the Russian Orthodox Church Abroad and especially to Bishop Michael who was so worried about our lives and the lives of our flock. We also thank Father Victor and Matushka Maria; our administrator Father Daniel and Matushka Sophia; Father Raphael I Martinez Gonzalez of the delegation from the Dominican Republic. Also Father Deacon Matthew Williams and his family; Martin Naef and all the priests, deacons, monks, nuns and laymen that sympathized with us. Thank you for your support. Three million people find themselves in great difficulty in Haiti and need your help. In the three cities that are most devastated, Port au Prince, Jacmel, and Leogane, half of the homes of our parishioners were destroyed, the reader Vladimir perished in the ruble, and five of our parishioners are reported missing. 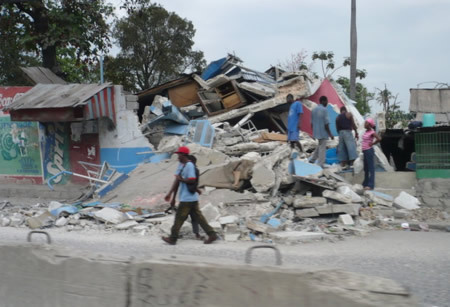 The church parish, Our Lady of the Nativity of the Mother of God, and the Chapel of St. Moses the Ethiopian, are dangerously fissured, the Church of St. Peter and Paul is destroyed, the temporary Church of St. Augustine in Jacmel is in very bad condition. The School of Our Lady of the Little Ones, directed by Father Jean Chenier Dumais, was destroyed and the School "Home of Love in Haiti" for handicapped and retarded children is seriously damaged. These spaces are no longer usable and need reconstruction. The needs are immense. We need help in rebuilding our churches, rebuilding our schools and a clinic, making temporary lodging for our flock with food, clothing, toiletries, medicines and financial assistance. We continue to count on your spiritual help (liturgical books, vestments for clergy and acolytes, liturgical materials and icons) as well as the education of future clergy. Vladika, we would like to find international financial organizations in Russia, in France, in Switzerland, and in the United States capable of organizing reconstruction and other projects with us. We seize this occasion to repeat our greetings and take this opportunity to again consecrate ourselves entirely to the spiritual and material well-being of all the parishioners of the Mission. We count on your prayers Vladika. We are so shaken, shocked, anguished, traumatized and beyond by the situation. Pray for us. "Members of the Haiti Mission are afraid of the future..."
Our newsletter is out - see how much good you've done!